Probably the most important pro example section on this whole web site is this one. So much misinformation about the follow through is being taught with the number one reason being “Well this is what the pro’s are doing.” On the surface, what I am teaching may seem counter to what the pro’s are doing, but the follow through explanation section explains precisely what the pro’s are doing and why people think they see them doing something else. As with the other pro example sections. almost every one of the key points are done by the pro’s. Especially for the first phase, the elongating the hit zone phase. The biggest difference will be with the feet, but that has a lot to do with the fact that the pros will adjust their feet and bodies first while in a less than ideal situation. The last element that will be adjusted will be the arm and racquet. During the finish phase there will be quite a bit of differentiation, but this is because different circumstances of the game cause different recoveries. 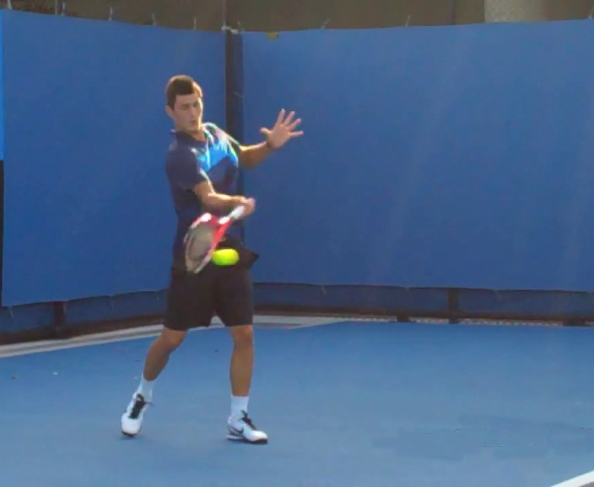 The first example is Bernard Tomic. Bernard does all 8 of the key points. The first images show the follow through without the key points being highlighted. The first image is one frame after contact, the second image is three frames after contact. It is obvious that Bernard could still hit the ball even on the second image. Hover over the image to see his follow though. The second image shows the key points highlighted. Hover over the below image to see the key points highlighted. The second example is Andy Murray. 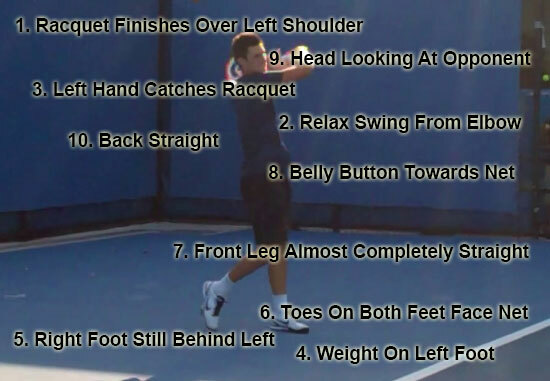 Andy also does all 8 of the key points. He does not extend the hit zone quite as far as I would recommend, but he still does extend it. In the second frame it will look like his racquet face is closed and not vertical. It is somewhat closed, but this happens because Andy hit the ball off-centered. 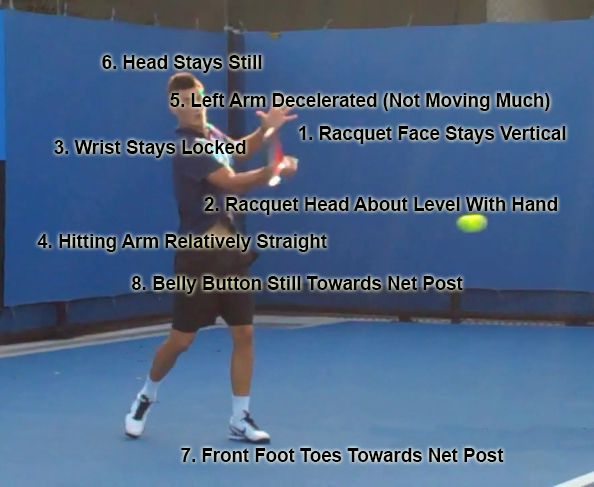 Look at the below image and see that the ball is more towards the bottom of the racquet. This will cause the racquet face to close after impact. If he had not hit the ball off-centered the racquet face would have stayed vertical. Hover over the below image to see Andy’s extended hit zone. 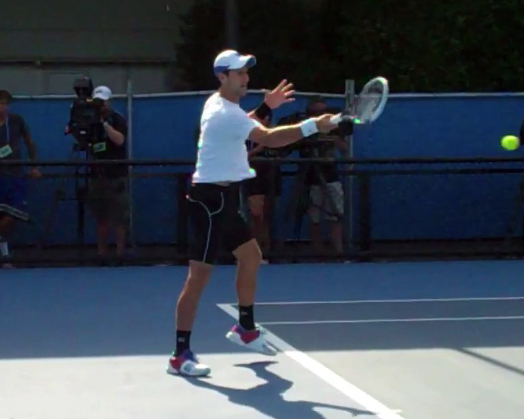 The pro’s have many different ways of “finishing” the forehand. The term “finish” is definitely just a figure of speech in that it is very hard to tell exactly when the swing is over. When playing a point a player cannot afford to stop one stroke before getting ready to hit the next one. I even hesitate in calling this the finish as it is actually just a snapshot of a moment of the recovery. I will be focusing on two distinct finishes. 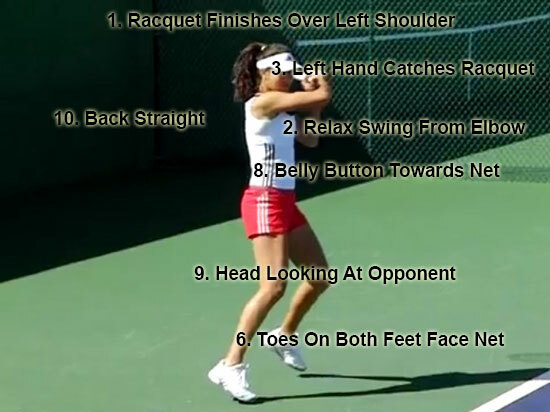 One with the racquet finishing over the left shoulder and the second with the racquet finishing on the left side of the body. I recommend most players finish with the racquet over the left shoulder and as mentioned before almost all pros will finish with their racquet over the left shoulder at times. This is also the phase where the pros will differ the most from the key points. Most of the differences will be in the feet area and can be attributed to the fact that they are playing points and in a very dynamic situation. If they were more static (practice hitting and not playing at full speed) their feet would end up more like the key points I advocate. The other big difference that can happen in either finish positions, but tends to happen more when the racquet has finished off the left side of the body is that the player will be more apt to rotate either the forearm or wrist. In almost every case the movement of the wrist or forearm will not happen until this phase of the swing. 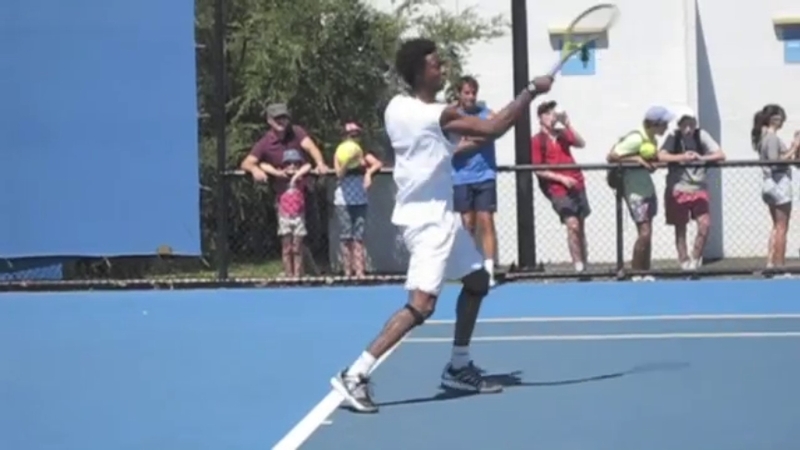 In the below image of Gael Monfils his wrist is still locked at the end of the first phase of the follow through. 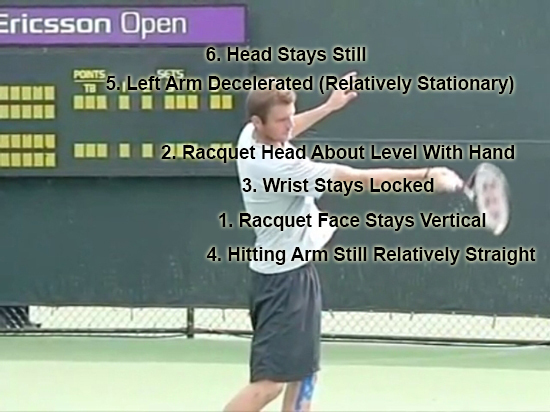 If the wrist or forearm is not moved the racquet will finish on edge. 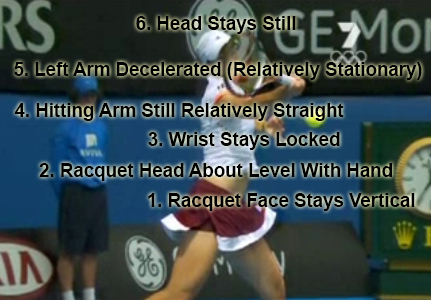 The first image is showing the racquet over the shoulder and in most cases shows the left hand catching the racquet. 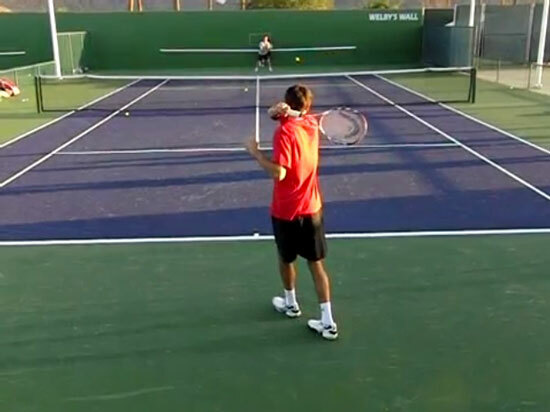 This is almost identical to how I recommend a player finishes the forehand swing. The second image shows the player a little further into the recovery. This image will vary from player to player and from point to point. 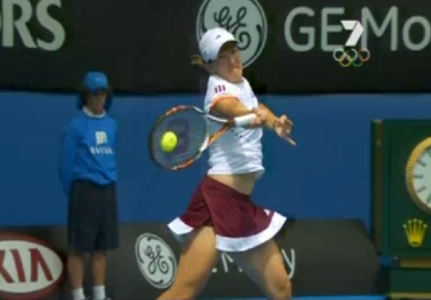 I am showing this second image to highlight the fact that tennis is a very dynamic, not static, sport. The first example is Ana Ivanovic. Of the 10 key points she does 7 of them. The three she does not do are in the legs and feet. Hover over the below image to see the key points highlighted. By the second image Ana’s weight has shifted onto the left foot. and her body has turned further to the left. This aids in her recovery for the next shot as she needs to move to the left to get ready to hit the next shot. The next image is of Marin Cilic. Marin does 8 of the 10 key points. One key point he does not do is catch his racquet with his left hand. 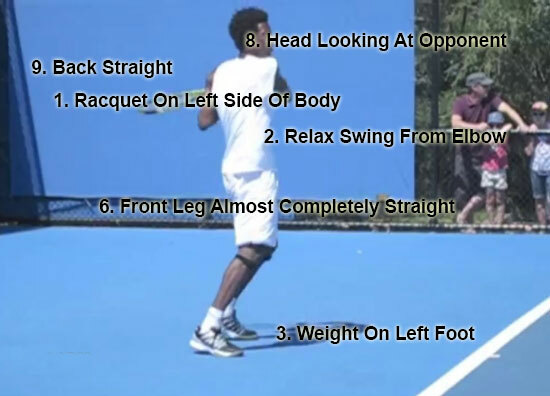 This will become a problem in the second image as the racquet will end up going pretty far behind his back and will have a much further distance to travel to recover for the next shot. The other key point he doesn’t do is have both toes point towards the net. He does correct this by the second image. Hover over the first image to see the key points highlighted. 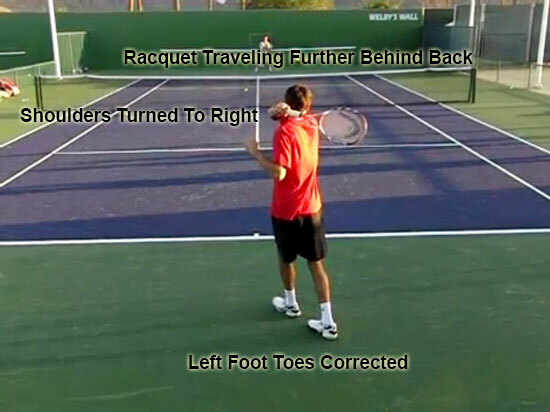 Hover over the below image to see the racquet travel farther behind the back and Marin correct his left foot and get the left toes lined up with the right foot, They will now be pointing towards the right as he will be recovering slightly to the right. 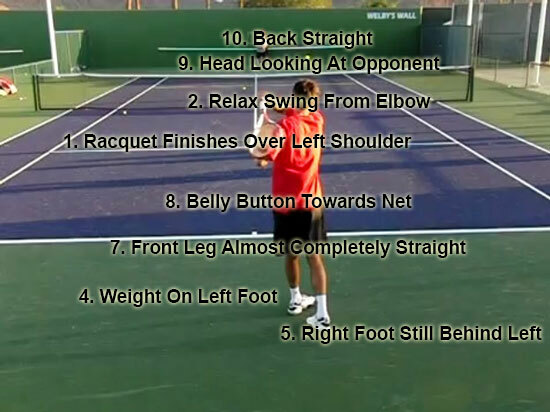 His shoulders will also rotate towards the right which is caused by the racquet going further behind his back. This too can aid in the recovery as it gets the body moving towards the right. The third example is Bernard Tomic. Bernard does all 10 key points. This is a picture perfect example of how a player should finish with the racquet over the left shoulder. Hover over the first image to see the key points highlighted. 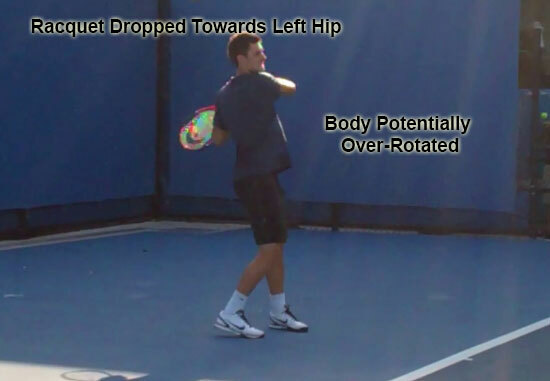 In the second image the racquet has actually traveled down more towards his left hip which will pull the rest of the body to the left. As with the other examples this will make it easier for Bernard to move to his left for the next shot. In this instance Bernard most likely does not need to move to the left so bringing the racquet down to his hip is not necessary. 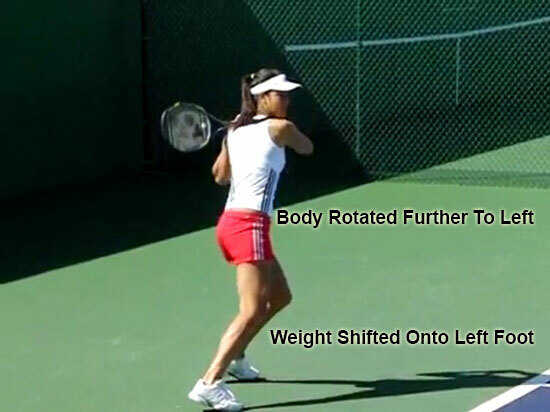 The biggest difference with the racquet finishing off the left hip beyond just the obvious position of the racquet is that many times the shoulders and trunk will rotate beyond being parallel to the net. Many times the belly button will be pointing towards the left net post. 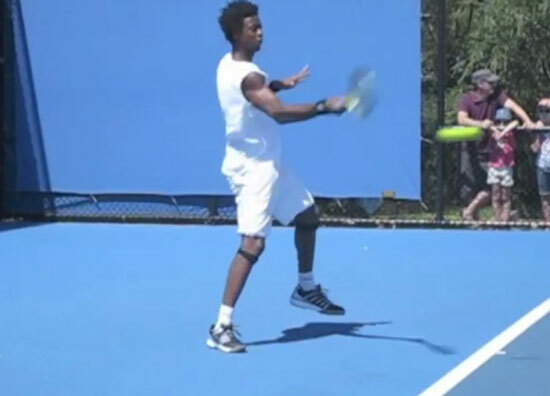 This happens because the racquet travels further to the left when finishing off the left side then it does by finishing over the left shoulder. This will pull the upper body further to the left as well. As mentioned before this can have the increased benefit of making recovery quicker as the body can move quicker in a lateral way around the baseline. But, it also has the drawback of making it virtually impossible to move forward towards the net. This is one of the main reasons professional level players do not come to the net much anymore. Is this right or wrong? The answer is both. It is right for players who do not intended on coming to the net, but wrong for a player trying to go to the net. If a player tries to go to the net with the belly button pointing towards the left net post they will first need to stop the momentum of the body going to the left and then get it going forward. This takes time and can mean the player will not get very close to the net making the volley much more difficult. 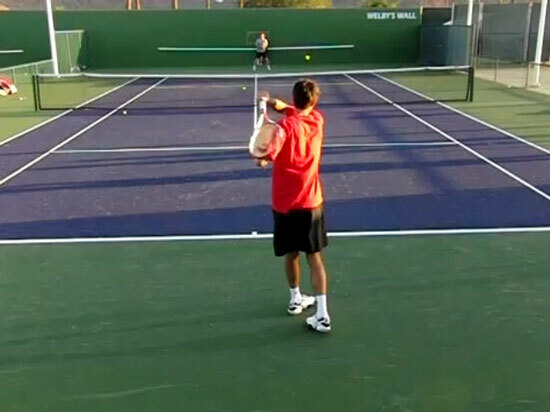 Most players efficiently attacking the net will finish with the racquet over their left shoulder as it keeps the bodies momentum going forward towards the net. 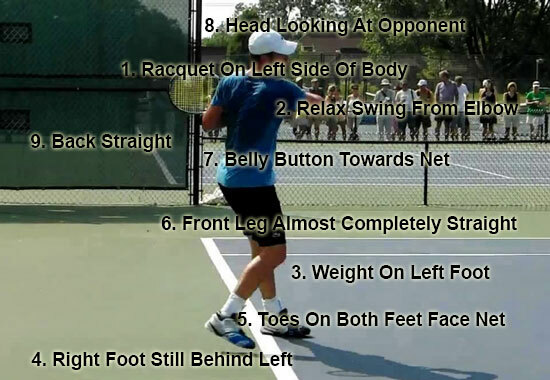 Another difference between the two finish positions is that the left hand does not need to be used to stop the racquet from moving further as the left side of the body acts as a natural brake to stop the racquet. The first pro example is Andy Murray. He does 8 of the 9 key points. Andy does not have his belly button pointing towards the net post. With his belly button pointing towards the left he would have a hard time moving towards the net. 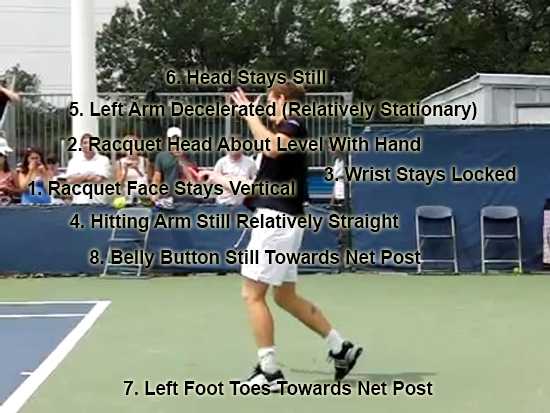 Andy also doesn’t have his weight completely on his left foot, but most of his weight is on the left foot. The first image shows that the racquet does come up to above shoulder level before coming down. The second image shows the other key points highlighted. Hover over the below images to see the key points highlighted. Although not wrong, Andy does move his wrist at this point of the swing. The bend in the wrist can be seen in the below image. 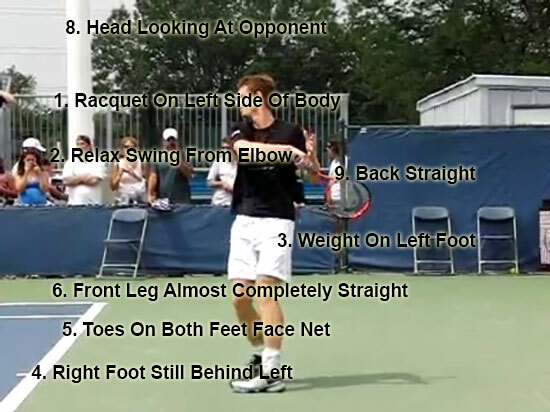 The other give away is the position of his racquet in the second image when his racquet is on his side. 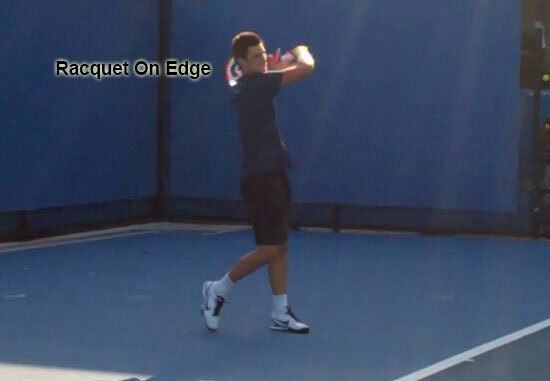 The racquet will be parallel to the ground and not on edge. The next example is of Caroline Wozniaki. Caroline does 4 of the 9 key points. But most of the missing key points revolve around her feet. She also over rotates just slightly so her belly button is not quite pointing towards the net. Unlike Andy, Caroline does keep her wrist and forearm fairly locked as her racquet does finish much more on edge in the second image below. 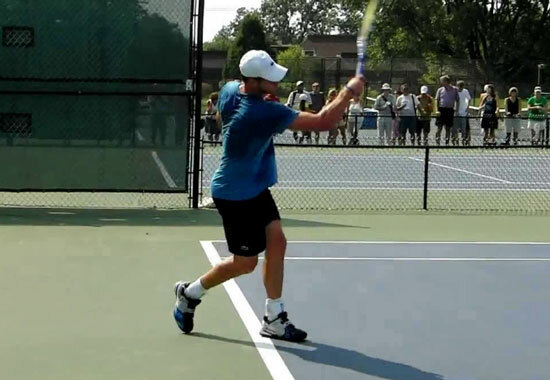 The next pro is Andy Roddick. Andy does all 9 of the key points. 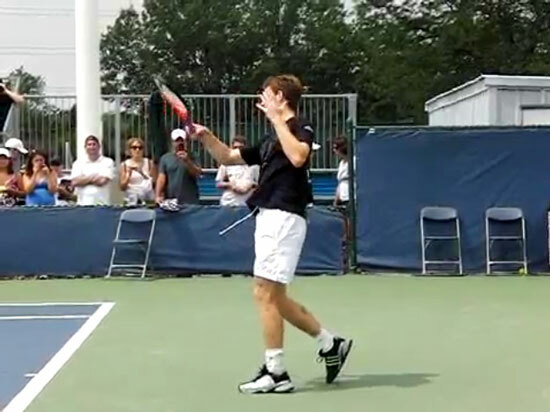 This Andy does not move his wrist or forearm so his racquet ends up on edge at the finish. The last example is Gael Monfils. Gael ends up doing 5 of the 9 key points. Very similar to Caroline above, he mostly have to do with the feet. Although he does get his belly button pointing much further away from the net and does move his wrist. Gael also moves his wrist before the finish. That is why his racquet ends up parallel to the ground.